Garden Cottage is a stone built Victorian cottage with its own enclosed garden situated in Strachur Park. Originally laid out in 1789, Strachur Park covers some four hundred acres of lush pasture broken up by stately avenues and stands of mature trees - mostly limes, beeches and Scots firs. There are woodland walks with species rhododendrons and rare shrubs as well as nature trails offering an abundance of wild flowers and wildlife. The park also has a small river running through it and a secluded lochan. The Macleans of Dunconnel have lived at Strachur House since 1957. They are a family of soldiers, writers and travellers. The late Sir Fitzroy Maclean was a celebrated war-hero, writer and diplomat and, some say, the original model for Ian Fleming's James Bond. His son, Sir Charles Maclean, who now lives in Strachur House with his family, is the author of books on Scottish history as well as bestselling suspense novels. Argyll is rich in history and legend - from the glen of Rob Roy's cave above Inveraray to the misty Mull of Kintyre - the area of South Argyll is accessible, yet largely unspoilt. Along the shores of Loch Fyne (easy to explore by its coastal roads) there are castles, gardens and quiet places to picnic. The historic town of Inveraray, the 'pearl of Argyll', is just a twenty-five minute drive from Strachur. The country around Kilmartin to the west of Loch Fyne, one of the most fascinating parts of Scotland, is an hour and a quarter drive from Strachur. The landscape is littered with ancient monuments - standing stones, stone circles and burial cairns. Further afield but within striking distance are Oban, Kintyre, the Trossachs, Stirling, Perth, Glencoe and Fort William. We are also well-placed for excursions to the Inner Hebrides. The lovely islands of Gigha, Arran, Mull and Iona - to name just a few - can all be visited inside a day. Closer to home, Mount Stewart on the Isle of Bute and Inveraray Castle are two stately houses well worth a visit. On the edge of Scotland's first National Park, Strachur itself is an ancient settlement, steeped in history and folklore with friendly interesting people to meet and many hidden corners to discover. There's plenty to do and see in the area. Hill-walking and climbing opportunities abound. Boating, sailing and sea-fishing are also available locally. There are several delightful golf courses within a half hour's drive. Tennis can be played in most weathers on the village court. Garden Cottage (sleeps 5) is a stone built Victorian cottage with its own enclosed garden in Strachur Park. 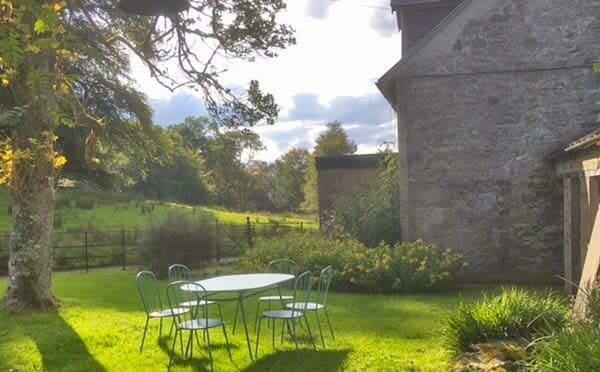 The cottage is approached by 250 yards of farm road that leads from the village of Strachur down an avenue of beeches to the old walled garden (no longer in use) and to the fields and woods beyond. 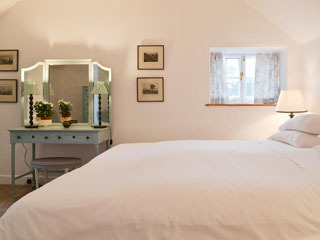 The cottage is full of light and all rooms look out onto peaceful parkland. Downstairs there is an entrance hall and a large well-equipped kitchen with electric hob and oven, fridge freezer, washing/drying machine and dishwasher. 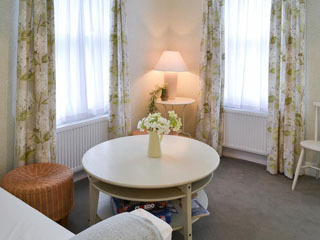 Two sitting rooms, one with an open fire, TV (Freesat) and DVD player, allow for great flexibility. 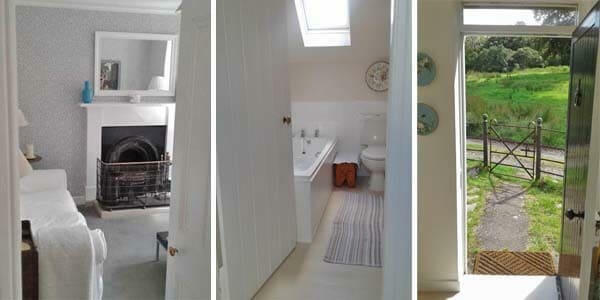 Also on the ground floor is a single bedroom overlooking the old walled garden and a bathroom with shower and lavatory. 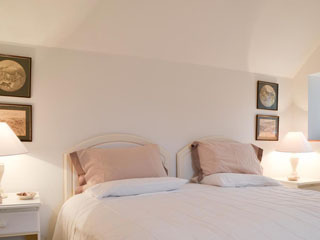 Upstairs the accommodation consists of two bedrooms each with king-sized beds which can both be made into twins. The bathroom has a bath tub for those who enjoy a soak. There is wifi throughout the house and oil-fired central heating. An initial supply of coal and logs will be supplied for the open fire; thereafter logs are available from the estate. Dogs are welcome, but must be kept on a lead in the park and sheep fields at all times. The filling station, post office/shop and doctors' surgery are all only 10 minutes' walk away. There are two pubs in the village - the Clachan Bar and the Creggans Inn. The nearest shopping town is Dunoon, a half-hour drive. Eating out is easy, there are a number of excellent restaurants in the area. Among them the award-winning 'Inver', only fifteen minutes away, the seafood restaurant 'Samphire' and the George Hotel, both in Inveraray. Just over an hour's drive from Glasgow airport - a little longer if you come by Clyde ferry to Dunoon and along Loch Eck, one of the best kept scenic secrets in the Highlands. Edinburgh is approximately two and a half hours away. Central heating and electricity is included. An initial supply of coal and logs will be supplied for the open fire; thereafter logs are available from the estate. Garden Cottage is rented out throughout the year. Change over day is Saturday. Arrival time from 3pm, departure time 10am. 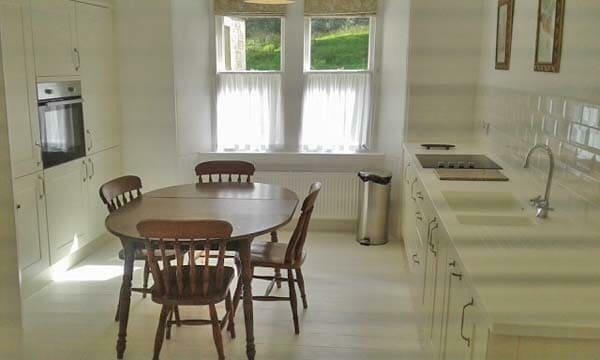 To book this charming self-catering cottage near Loch Fyne, click the enquiry button below and see availability and rental prices. 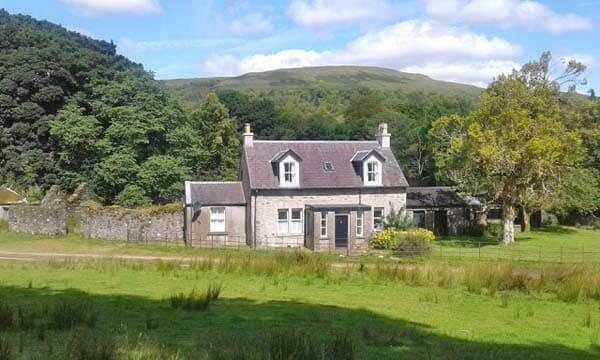 This newly refurbished self-catering cottage for 5 is very well appointed and set in glorious parkland in a beautiful part of Argyll. 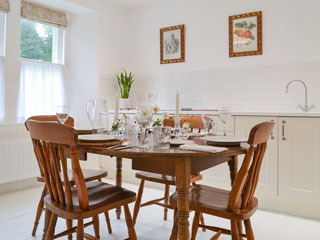 This cottage with an open fire is cosy in the winter and ideal for a break at all times of the year. Argyll offers so much including ancient monuments, perfect picnic beaches, beautiful gardens and fascinating castles.